Get out of town with these interesting Denpasar side-trips: Ubud (Sacred Monkey Forest Sanctuary & Tegalalang Rice Terrace) and Tanah Lot Temple (in Beraban). Pamper yourself for a day on the 13th (Thu) at some of the top local wellness centers. 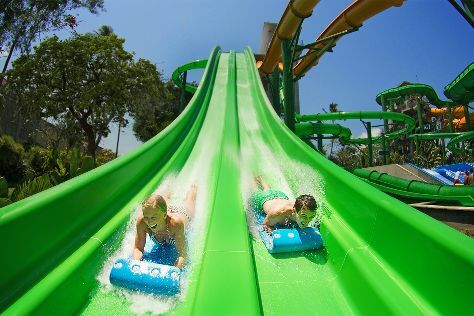 The adventure continues: make a splash at Waterbom Bali and stop by Makassi. To find more things to do, photos, and more tourist information, read our Denpasar trip itinerary planner. New York City, USA to Denpasar is an approximately 26-hour flight. You can also do a combination of bus and flight. Due to the time zone difference, you'll lose 13 hours traveling from New York City to Denpasar. Expect somewhat warmer temperatures when traveling from New York City in June; daily highs in Denpasar reach 86°F and lows reach 77°F. Wrap up your sightseeing on the 13th (Thu) to allow time to travel to Tegalalang. On the 14th (Fri), contemplate in the serene atmosphere at Tirta Empul Temple, make a trip to Istana Tampak Siring, and then identify plant and animal life at Elephant Safari Park. To find other places to visit, maps, photos, and other tourist information, read our Tegalalang road trip planner. Drive from Denpasar to Tegalalang in 1.5 hours. In June, daily temperatures in Tegalalang can reach 86°F, while at night they dip to 77°F. Wrap up your sightseeing on the 14th (Fri) to allow time to travel back home.